First, we’ll be joined by a medical doctor who asks a simple question: should we wear clothes that endanger the lives of the people who make them? Watch out for viscose, whether it’s Rayon, cellophane or the common dish sponge. The chemicals used to make them may have driven workers crazy. It’s just another journey into the underworld of the toxic society. Now and then, just one dedicated person can put the spotlight on a dangerous chemical. Every day, some of us wear or use the products made with this toxic process. Few people know fabrics like Rayon are made from forests boiled down by dangerous chemicals. So are cellophane and dish sponges. That person could be Dr. Paul David Blanc. He’s a real doctor and a professor of medicine at the University of California, in San Francisco. The story and the warning come in Paul’s new book “Fake Silk, The Lethal History of Viscose Rayon“. “The current “greenwashing” of viscose products as being eco-friendly (rayon fabrics, sponges, cellophane products) is exposed in FAKE SILK: The Lethal History of Viscose Rayon by Paul D. Blanc, M.D. (Yale University Press). • The popular Modal line of viscose fabric claims to be so environmentally responsible that the company’s production process is “as pure as the Edelweiss flower,” using “renewable and natural raw material.” Of course, they’re referring to the wood pulp, not the deadly carbon disulfide. • Bamboo-based fibers and SeaCell rayon (made with the addition of pulverized seaweed) are pitched to environmentally conscious shoppers without any mention of the harsh chemicals required in their manufacture. • Cellulose–based sponges are marketed for “eco-friendly cleaning,” as an alternative to the endangered, over-hunted sea sponge. The cellulose comes from wood pulp (the trees stewarded responsibly, of course), however they completely neglect to mention the dangerous chemicals used in the manufacturing process. • Natureflex, a new brand of cellophane, is being marketed as biodegradable and favored by organic food sellers. The company only uses certified renewable wood pulp, but neglects to mention it’s also manufactured through the toxic viscose process. As Dr. Blanc reminds us in our Radio Ecoshock conversation, the question comes down to: is it OK to buy and wear clothes which are not toxic or dangerous to ME, but were deadly or damaging to make? We can think of the textile workers burned in a locked factory in Bangladesh. And now we have to consider the workers, often with poor or unenforced safety standards, who can either die young or go insane for their jobs, making our snappy clothes. “Abundance of Microplastics in the World’s Deep Seas” (2014-12-16). There some better ways to control the risk of carbon disulfide. In the book, Dr. Blanc describes the modern production facilities of the Lenzing Group in Austria. The areas containing carbon disulfide are carefully enclosed and vented, for worker protection. It didn’t surprise me to discover in this book that former rayon factories became toxic waste dumps, known in America as Superfund sites. Most of the toxic rayon production facilities moves from the Northern United States and Britain, to the lower taxes of the American south, and then to Asia. Given the horrible effects of workers, maybe Donald Trump won’t want to bring these jobs back. The cellophane makers and dish sponge plants in the United States and Europe continue to use this lethal chemical. Here’s another issue with Rayon/viscose that goes beyond the medical doctor. Paul and I didn’t discuss this, but I happen to know. Toxins and worker’s rights are not the only problem with viscose/rayon fabric. Every year, between 70 and 120 million trees are cut down to make rayon, viscose, modal and other trademarked textiles. Ancient forests are logged, rare ecosystems leveled, forest-dependent communities affected – and the forest homes of threatened and endangered species such as orangutans, tigers, elephants, bears and wolves are hauled off to make t-shirts and suit jacket linings. Fortunately, efforts are underway to reverse this trend. In 2013, the environmental group Canopy launched a campaign to change the course of the fashion industry. Now several of the world’s largest clothing brands and iconic designers have committed to end all fiber sourcing from the world’s ancient and endangered forests in 2017. H&M, Zara/Inditex, Stella McCartney, Marks and Spencer, Levi Strauss and other global retailers and designers have signed on to CanopyStyle. Over 85 brands and several of the world’s largest viscose producers are on-board. But there’s more work to be done. IPEK GENCSU – CAN WE REALLY PLAN FOR A “SUSTAINABLE” WORLD? There are still the optimists who work to persuade world governments to start aiming for a sustainable world. Let’s hear what they think. More than a few scientists on Radio Ecoshock tell us our present economy threatens to kill us, and take out many other species in the Sixth Great Mass Extinction. Surely, we all have an interest in a new climate economy. That’s a huge global task. I’ve come across a report that seems written in a bland code for top government and corporate planners. But there are gems buried in this work, titled “The Sustainable Infrastructure Imperative.” It’s the 2016 report from something called “the Global Commission on the Economy and Climate”. Their web site is newclimateeconomy.net. 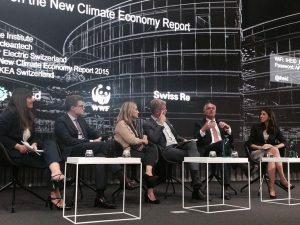 The Global Commission on the Economy and Climate was commissioned by seven countries – Colombia, Ethiopia, Indonesia, Norway, South Korea, Sweden and the United Kingdom – as an independent initiative to report to the international community. To help us sort out who that is, and what this report can tell us, as citizens of this planet, I’ve called on Ipek Gencsu. She’s the Research and Engagement Manager at the New Climate Economy. Ipek has degrees in politics and economy from the London School of Economics. You may also have heard about her as a campaigner for the charity Oxfam, and for climate and food justice. We head on out with more clips from my 2009 Radio Ecoshock show. And please don’t forget, you can download all ten years of Radio Ecoshock shows free, courtesy of Radio Ecoshock listeners. There’s a wealth of great science, authors and activists whose voices are still worth hearing. Feel free to load up your phone, Ipad, or whatever with those mp3 files, to listen and learn. I’m Alex Smith, saying thanks for listening, and caring about your world. She doesn’t seem to address how MINING for ALL THAT RAW MATERIAL for massive infrastructure is going to help anything… more co2 just in doing THAT… and any efficiency in fuel use.. and less fuel use.. is going to be off set to some degree… by POPULATION GROWTH…. … also, how does food grown in the agricultural areas… get to the inner parts of these massive cities?… Sure, the idea of “urban gardens is a quaint idea… but, I for one, would NOT want to be STRANDED in the middle of one of these, NATURELESS hell holes… because, if you ask me, that is what they will be… and already are….